Need Your Help: Where Should We Go? Hey there! Sorry I missed two days of blogmas (blogging every day until Christmas) but life got BUSY! I’m back though :). Yesterday I braved the mall to do some shopping for family, and got a couple bits for myself as well. My friend Peta-Gaye, who is a skin care addict like me, tried to pass some judgement but in the end she came around :). 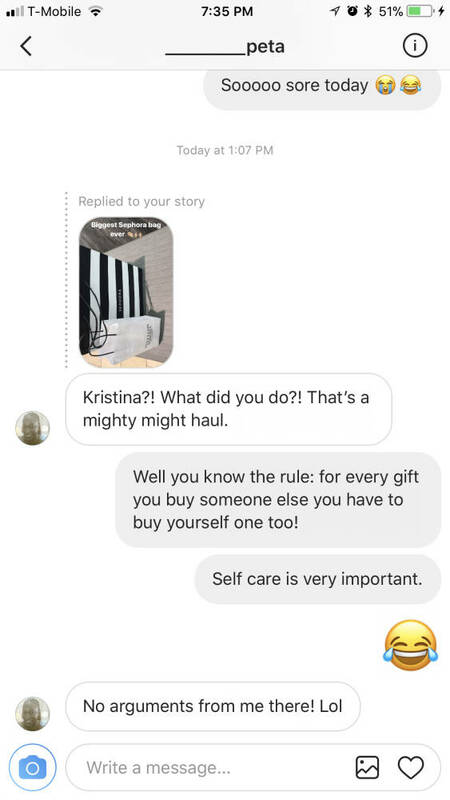 I mean, I think we can all agree that self care is important. Okay so now I need your help! Back when I thought I was going to get my stitches out earlier this month Adam and I had planned to go to Blood Mountain in Georgia for a few days so we could hike parts of the Appalachian Trail and enjoy cooler weather. Unfortunately I still have my stitches in and am on limited activity so that trip is out. Now we’re trying to decide last minute what we should do the week between Christmas and New Year’s since we both have it off. Our top two choices currently are: Vegas and NYC. What I really need to know is: what are other things we could do in NYC? Adam and I are most concerned that we would run out of things to do since he doesn’t like sightseeing/touristy stuff. My mom and I had a great time when we went at Christmas two years ago, but we did a bunch of touristy stuff. I’m inclined to book NYC because the flights will be more manageable, but at the same time Adam and I have never been bored in Vegas. Even though we are both homebodies, we love Vegas because we love going to shows out there. I would really love to see Britney’s show before her residency ends. I think earlier this year it was voted best show in Vegas! So, if you live in or near NYC please let me know what other things we could do. OR if you think we should go somewhere else let me know that too! We just want to have a fun week :). Thanks! Where should we go and what should we do for Christmas vacation? Previous Post Let’s Talk About Concerts! I think you have your answer- Vegas baby! Maybe flights are annoying but if you have a week then the annoying flight could be worth it. My thought was so save NYC for when you guys want to go away for just 3-4 days. That way you know you won’t run out of things to do. Run in Central Park, Broadway show, museums, really good restaurants, and there’s this: https://www.eataly.com/us_en/stores/nyc-flatiron/. Now here is another idea. Philly is just an hour and a half amtrak ride from NYC, and if you book ahead of time, it would only be $39 per person. If it interested you to ever go to Philly, you could fly up to NYC, stay there a few nights, take the train down to philly, stay a few, fly home from philly. This would require more planning BUT maybe for a vacation in the future. Thanks Megan! Yeah, you’re right, we would love going to the museums. That’s definitely something to add to the list. It makes me think maybe we should consider DC too since I love the museums there too. What are some cool things to do in Philly? I’ve never been! Sorry, I have never been to New York City. I think it would be an interesting trip, but I think it might be pretty darn cold for you Southern folk 🙂 Vegas is always a lot of fun, so I would vote for that. NYC would be fun in the spring or early summer maybe? Hahahah yeah I think it might be too cold :). When my mom and I went two years ago it wasn’t too bad, but I think we got lucky! Plus I tolerate the cold a lot better than Adam and IDK if he would like it even if it were in the 40s/50s. I’m going to vote for Vegas just because you get to see BRITNEY! I wanted to go so bad but then Lily had to have surgery 🙁 If you can stand the long flight then I think you both would have more fun. I love NYC but the crowds around Christmas are a bit much. We went last year because I had never seen the tree at Christmas, and by the time we got through I just wanted to go home lol. Oh, Britney for sure! Plus NYC would be a lot of walking/being outside, which could probably be pretty miserable in December. Especially if you guys don’t have proper winter coats/boots. I haven’t done too many of the touristy things in NYC, I usually just do a massive amount of shopping and maybe some art museums if I have the time. But I have a history of art degree and LOVE museums, this may not be as appealing to you and Adam.